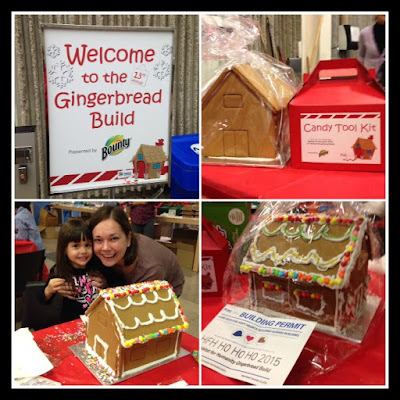 Last weekend Hannah and I had the opportunity to participate in the 13th Annual Habitat for Humanity GTA Gingerbread Build at the Ontario Science Centre. She might not be old enough to build actual houses, but Hannah was amazing at decorating a gingerbread house for a great cause. As the Presenting Sponsor of Gingerbread Build 2015, Bounty once again makes Habitat GTA a part of its holiday celebration. 100% percent of the funds raised through Habitat's Gingerbread Build go directly to building more Habitat homes for families in need of affordable housing in the GTA. You can still participate in the Gingerbread Build - you can purchase a kit to put together at home, or purchase a kit for a family in a shelter to put together. For more details, visit http://gingerbreadbuild.weebly.com/build.html. Right now every donation to Habitat for Humanity will be matched dollar-for-dollar by P&G until December 31st, 2015. For more details, and to donate, visit here.